It’s July, and that means Summer just began, right? I live in South Carolina and we only just hit consistent temperatures in the 90’s. We had an actual Spring, for a change, and it lasted forever. No wonder it’s a jolt to my system when I walk into Target and see huge displays of “back to school” supplies. Wait! I haven’t even scratched the surface of my summertime goals! I haven’t made homemade popsicles! I haven’t finished the kids’ summer listeners reading program at the library! I haven’t been to a baseball game! Or picked out a preschool curriculum for my four-year-old! Or made that inspiring vintage chore chart I saw on Pinterest. I haven’t organized every closet in the entire house! What’s worse, I haven’t found that awesome Summer of 2013 book. Luckily, my children aren’t school age yet and the end of summer comes at the end of, well, Summer, and not in mid-August. So I have time (theoretically) to do all of the above and maybe find a good book this summer. It’s proving to be a difficult task so far (although my Jean Webster discovery was a great treat!). To make the “difficult” reference clearer, I have started reading and abandoned halfway through no less than four books in the last three weeks. That is just sad. But I happen to be a reader who won’t stick with a book if I’m hating it halfway through. I stuck with The Last Summer because I really wanted to review it, and to review a book, you kind of have to finish it. Here are the books I began but couldn’t finish. Please don’t count these as official reviews since I only read half of the books. And please keep in mind that these books are not “terrible” and I am not looking to give a negative review. I think lots of readers would really enjoy these books. I’ll just tell you why I didn’t enjoy it and try not to give much of the plot of each book away. I was excited about reading Redfield Farm. It was number one on my Summer reading list and has great reviews on Goodreads. However, after a few chapters, I was pretty disappointed in the narrative style. It was a little flat. I didn’t get a good feel for the setting. And then the plot twists that occurred just seemed so utterly out of keeping with the characters, I couldn’t keep reading without thinking “ridiculous!” every few pages. It’s true that people do unexpected things and make mistakes in real life. Still, the Quakers were engaging in some pretty uncharacteristic activities in this book. If I had enjoyed the characters, I may have kept reading, but I didn’t. I wish I had, because the premise of the book with the Underground Railroad and the Quaker community working together sounded very intriguing. I think that if you enjoy books by Janet Oke or Beverly Lewis, you may like Redfield Farm. However, be forewarned: this isn’t a Christian book, so it’s not as clean as Oke or Lewis. Eve’s beloved Ivan died thirteen years ago in an automobile accident. Her charming, boyish Chuck has taken a different exit out of her life: hopping into his car in the middle of a garage sale with no forewarning and departing their formerly happy upstate New York home for points unknown. Now Eve’s a boat adrift, subsisting on a heartbreak diet of rue, disappointment, and woe-left alone to care for Ivan’s brilliant teenaged son, Marcus, and Chuck’s precocious, pragmatic nine-year-old daughter, Noni, while contending with Charlotte, Eve’s acerbic mother, who’s come north to “help” but hinders instead. But life ultimately must go on, with its highs and lows, its traumas and holidays, and well-meaning, if eccentric, friends. A house and a heart in disrepair are painful burdens for a passionate woman who’s still in her prime. And while learning to cope with the large and small tragedies that each passing day brings, Eve might end up discovering that she’s gained much more than she’s lost. I was in the mood for a present day, this-is-real-life type book. However, I got through most of it and then just let it go. I was trying to be interested, but the non-plot wasn’t quite neatly packaged enough. Maybe the real life situation was too far removed from anything I’ve experienced for me to feel the book was relevant to life. I think this book is probably a really good book, just not my type of book. I’d say that if you liked The Friday Night Knitting Club by Karen Jacobs, you will probably like this book. Another book of this type that I did enjoy was The Atlas of Love by Laurie Frankel. 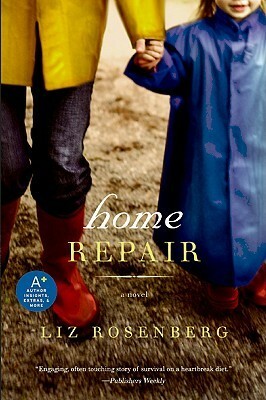 The characters in this book were always interesting to me and I am closer to their stage of life (graduate school, young mom days) than I am to the life stages of the main characters in Home Repair or The Friday Night Knitting Club. I saw The Perfume Collector advertised on Goodreads and borrowed the e-book from my library as soon as it was available. It was…well, rather sensual. I abandoned it pretty soon after starting it. Don’t read it if you dislike erotica. The characters themselves didn’t tempt me to keep reading, either. Grace was not very appealing–the smart, small, dark haired young wife of a professor who finds herself childless and feeling like a trophy wife, at best. That kind of character has been done so many times! The format of this book is one of those historical novels that shifts from a character in the past to a character in the present (the present in this book being the 1950s). I have read a few of those books that I really like (The Secret Keeper, for one), but I think that kind of plot can be clumsy if the author isn’t careful. In this book, it felt kind of clumsy. I wasn’t drawn in from chapter to chapter. I’ve read a few other reviews from people who did like this book to people who hated it, so you may have to just decide for yourself. 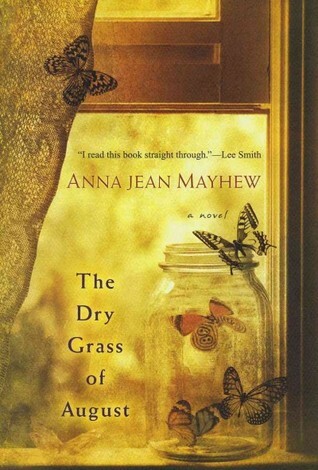 Finally, the last “meh” read I’ve had this month was The Dry Grass of August. I picked this book up after deciding not to read The Homecoming of Samuel Lake and it became a case of “out of the fire, into the frying pan.” The book’s plot follows 13-year-old Jubie and her trip with her mother and siblings to Florida in the 1950s. It was similar in some ways to To Kill A Mockingbird but the thing about books written around the African American plight in the 1950s is that they will never come close to being as ground breaking because they weren’t written in that time period (obviously). I’d also compare this book to The Secret Life of Bees but without the rich scenery and spirituality. It was actually a pretty good book, with a few too many crude details for my taste (I’m a prude, I know, I know). I probably would have liked this book better about five years ago. This summer, I’m just not in the mood for Southern lit. I just received Islanders by Helen Hull in the mail last week and I am itching to begin it. Also, I still plan to read The Princess and the Goblin before the Summer is over. How’s your Summer reading going so far?